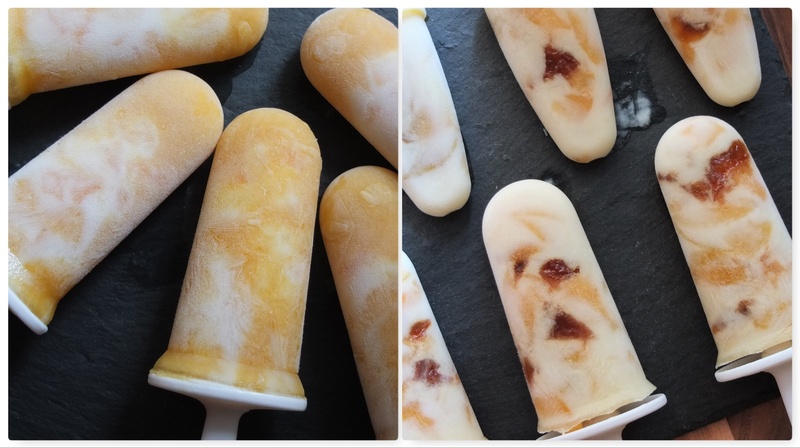 Below are various versions of this lolly. 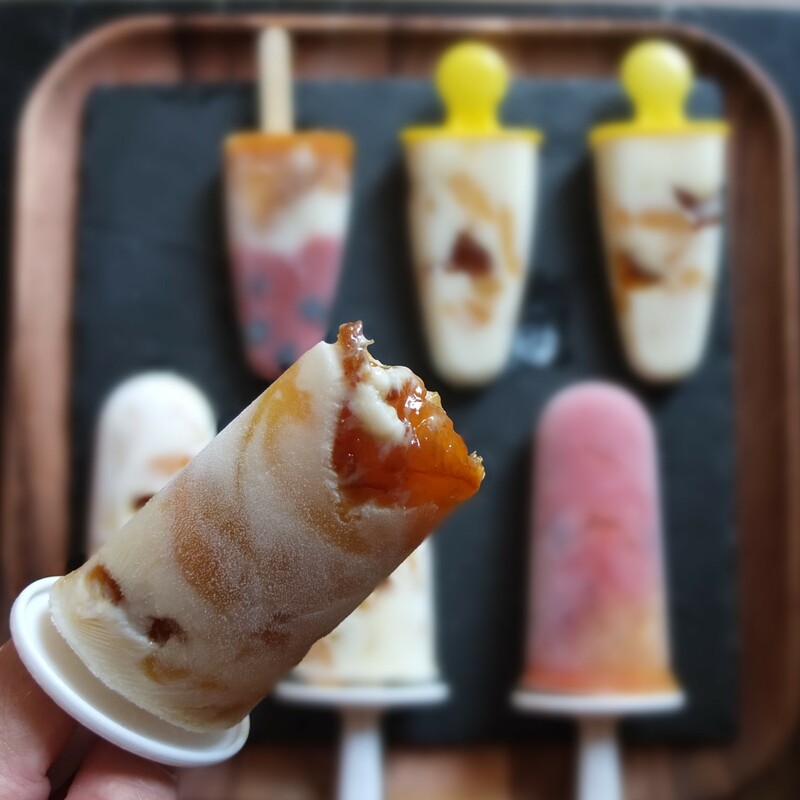 The two-tone ones have pieces of apricot plus kefir and apricot purée both sweetened with maple syrup. The pink lolly has blended raspberry and kefir. Spot the blueberries and raspberry pieces… ! The pink part with blueberries was frozen a few hours before topping with the kefir and apricot purée. 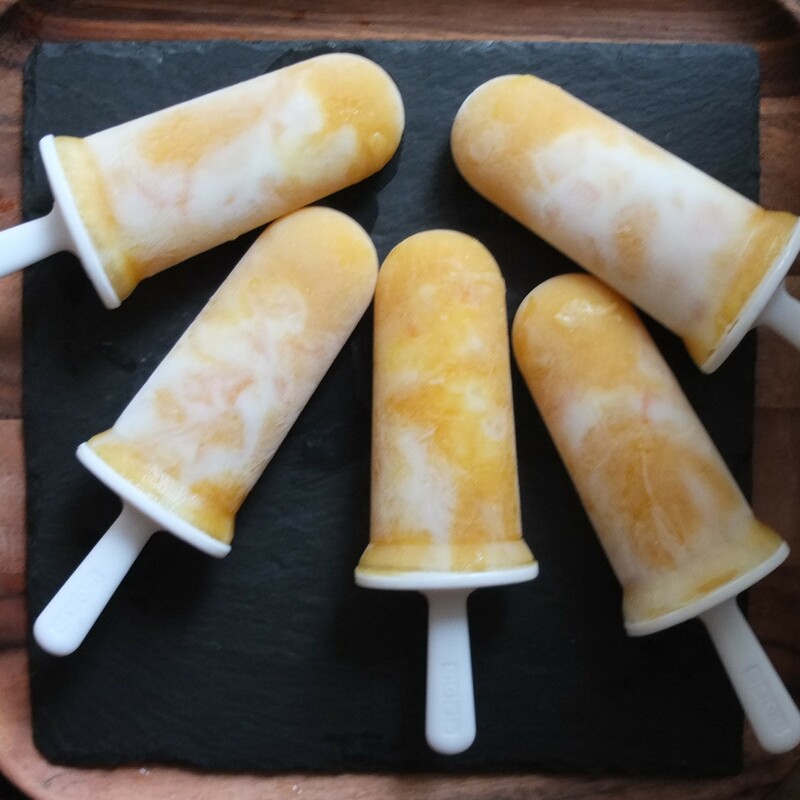 These lollies are invented based on the idea that you can use fruit purées, pieces of fruit, kefir and even marmalade in a lolly and that any liquid should be sweetened with a little maple syrup so it doesn’t become a solid block of ice (sugars soften lollies). 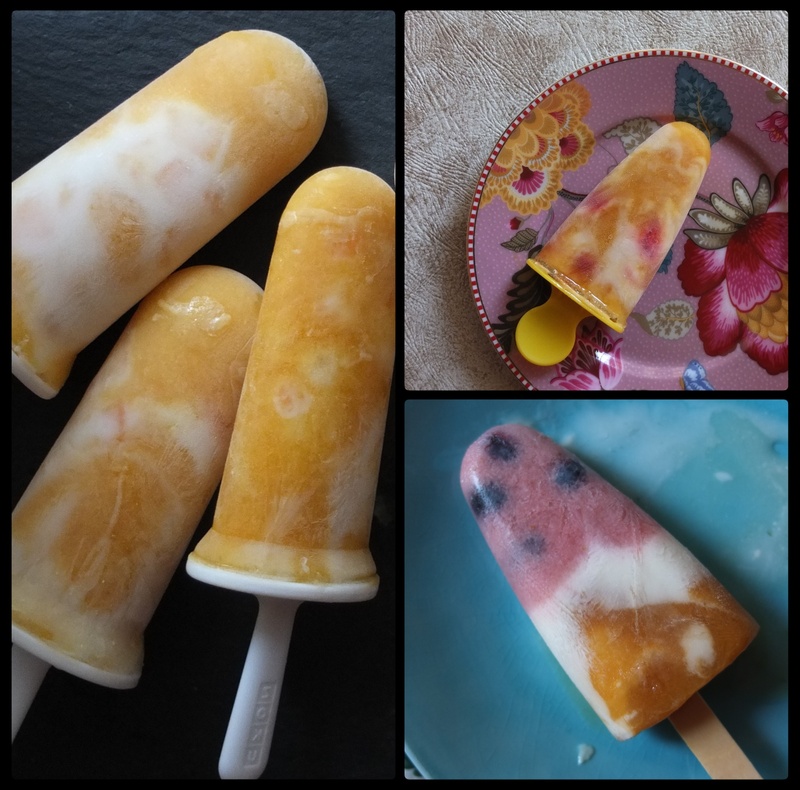 From Donna Hay’s popsicle recipes I saw it was possible to achieve a swirly effect or interesting pattern by dropping in spoons of kefir into the lolly mould (she uses greek yoghurt) alternating with spoons of chopped fruit then fruit purée. Don’t stir, just drop things in. 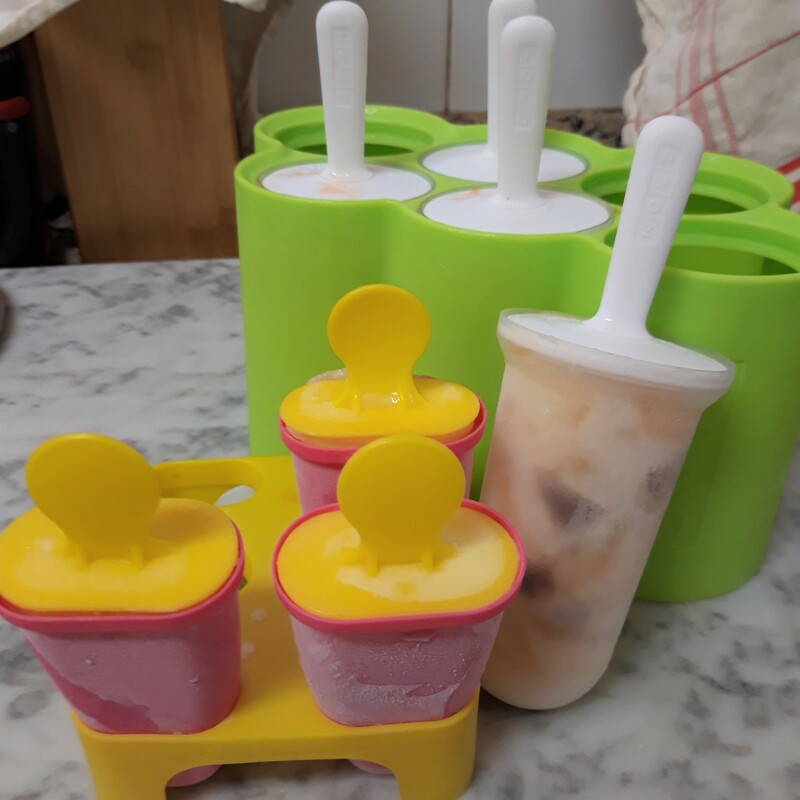 A couple of popsicle mould sets is handy. My very cheap IKEA set works really well and a recently-aquired posher Zoku ZK114 set is great because the lollies can be stored hermetically sealed in their original mould, which is transparent so you can check what’s happening as you layer then see which lolly you’re selecting to eat! Not getting sponsored to say these things by the way. 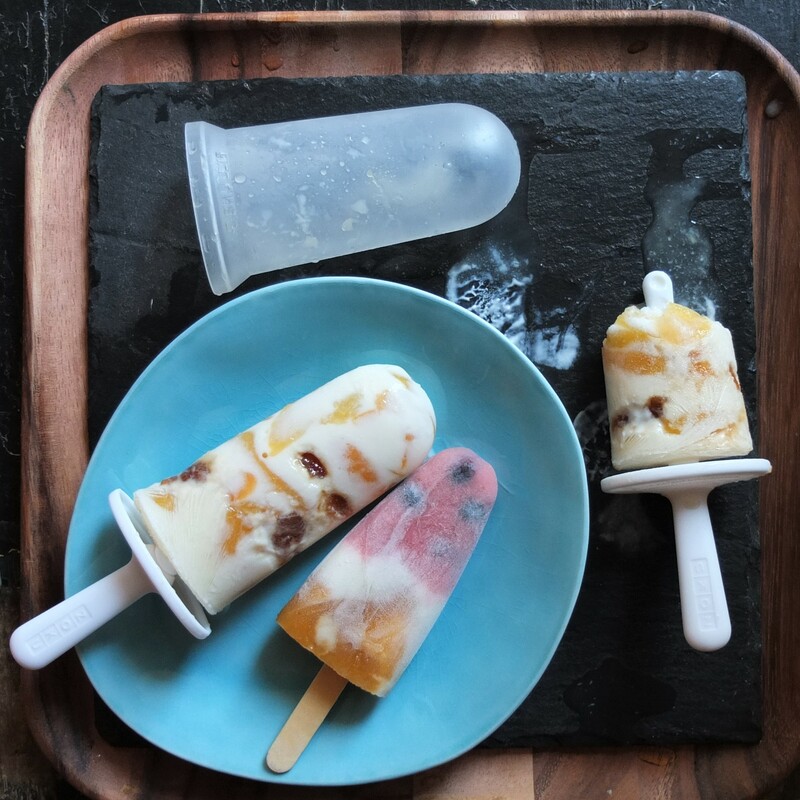 I initially thought of finding more pretty wooden sticks but the washable plastic sticks that come with lolly-making sets are very practical and reusable. 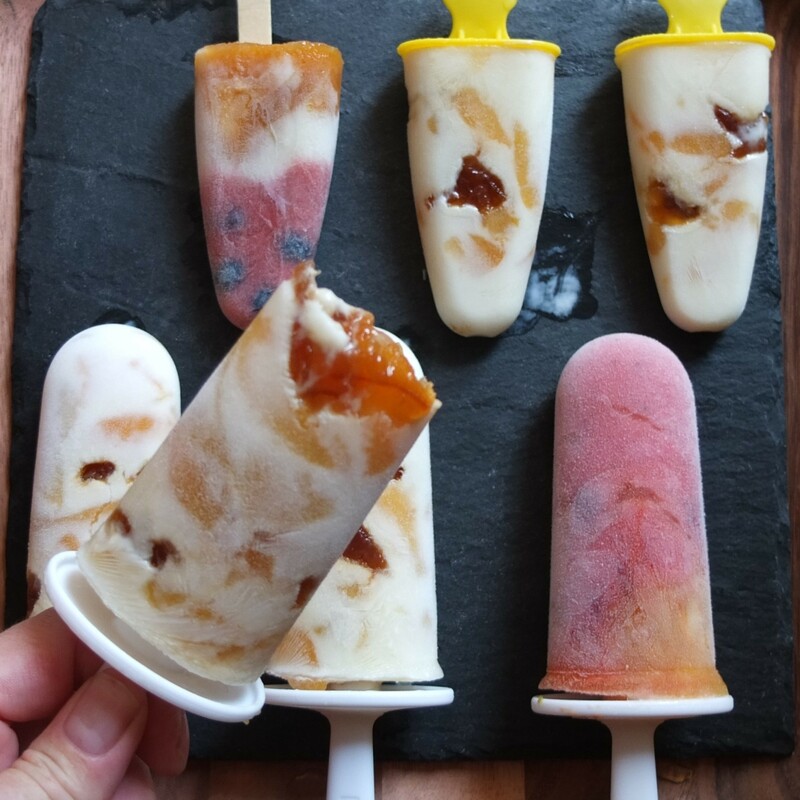 If you want to use wooden sticks wait a few hours until the lollies partially set in the freezer then insert the sticks. Makes about 8 big lollies (or 5 big lollies and 4 little ones), depending on the size of your lolly moulds. 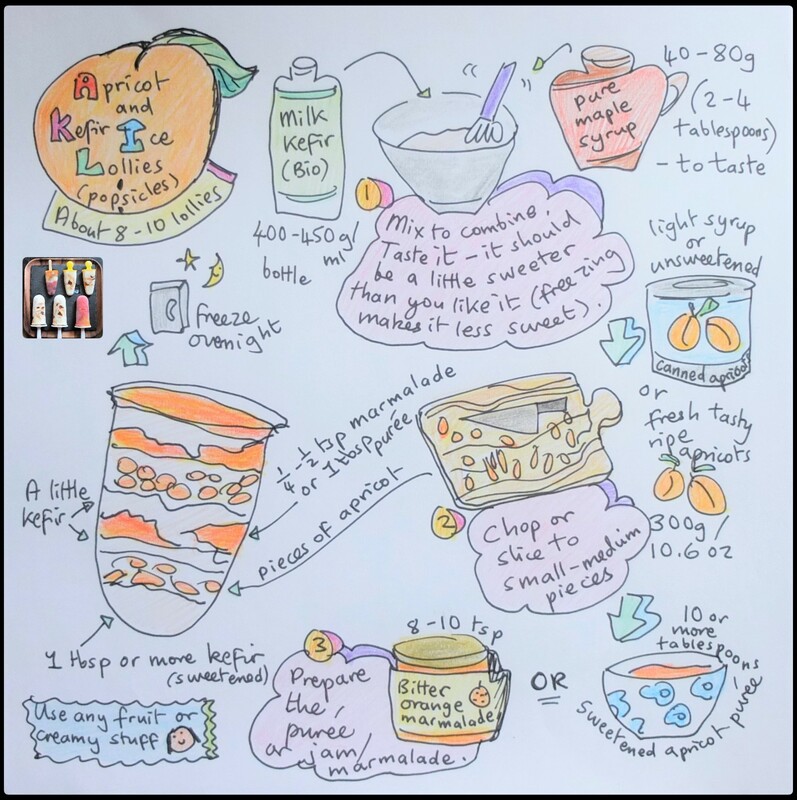 Note: there’s more of a swirl effect when using fruit purée (left photo) but the marmalade has a lovely surprise factor (right photo). Options: drop in slices of strawberries, raspberries, bananas or whole blueberries. 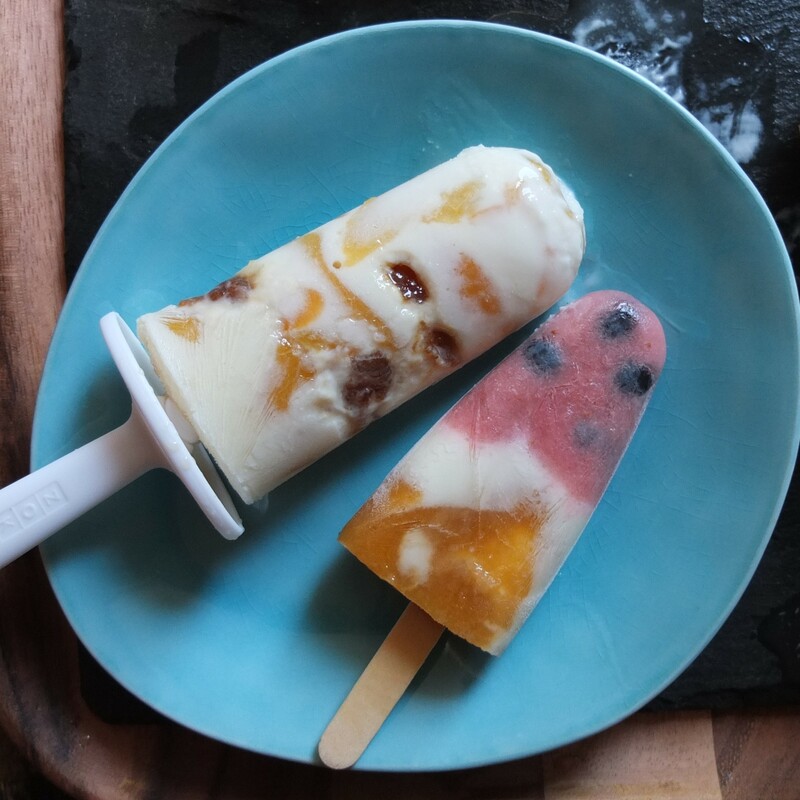 Blend other fruit with kefir or almond milk to make another layer. Use sweeteners like honey or unrefined sugar and greek yoghurt, coconut milk kefir or skyr! Eat before it melts and over a plate if you’re on a pretty sofa. Store in the freezer up to a week and probably a month or so but it’s always better to eat them as early as possible. As with most new popular superfoods there are super enthusiastic articles like this very readable Why kefir is not the new kale (it’s better!) then there are positive but more cautious articles that point out lack of solid evidence for certain health claims, like the BBC goodfood’s Health benefits of Kefir here. For vegans there’s 6 reasons to drink kefir (hey it can be vegan too!). Generally everyone seems to agree kefir has very impressive health benefits. Yay! 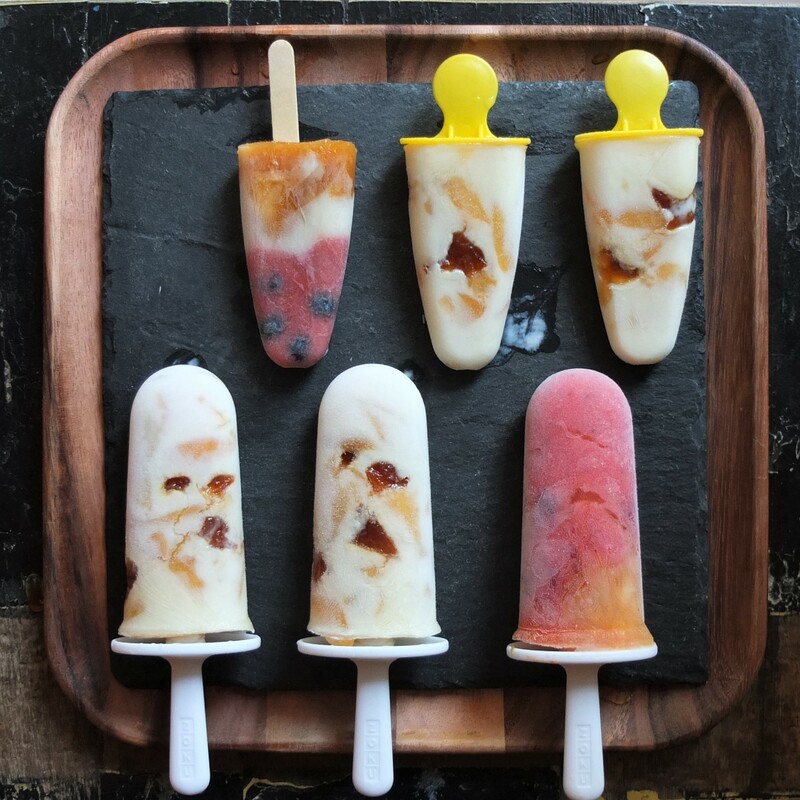 So have it in lolly form for a change… !